I'm always saying I want to incorporate more fashion & outfits into this blog, but never get around to actually taking the photographs to support that goal. Mostly due to pure laziness. It finally dawned on me that I could take photos in a mirror, via iphone, and since I've been posting them on the regular to instagram, I figured I may as well start a new series on le blog. Props to Melissa of Dear Baby for doing it first. Fuzzy bathroom shots for the win! If nothing else, this will really cut down on my outfit repeating (thank you, terrible memory.) 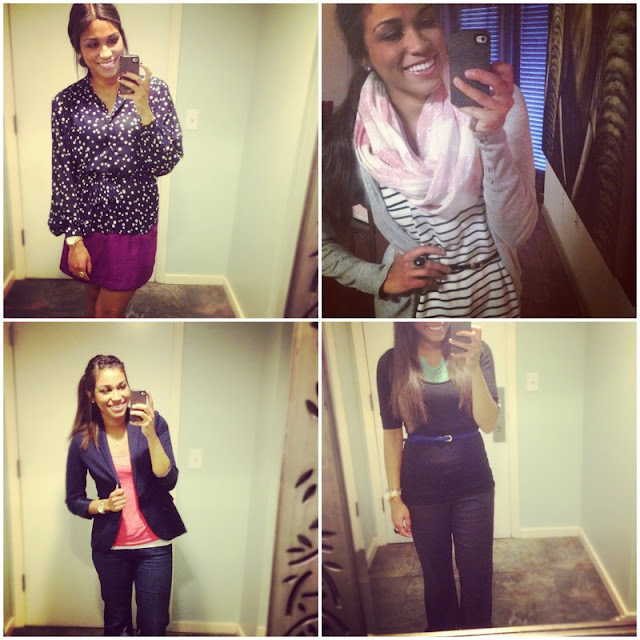 I give you...Powder Room Fashionista week one! The theme of the week was "I'm too tired & lazy to curl my hair." Next week, I think I'd like to open this feature to link up with fellow 8-5 "night bloggers" who refuse don't have time to squeeze in well-planned outfit shots. Cute outfits! It was so nice meeting you Saturday! Outfit posts are not easy. I always make my hubs take a few shot on date night! Thank you! It was really nice meeting you too, Brittany!